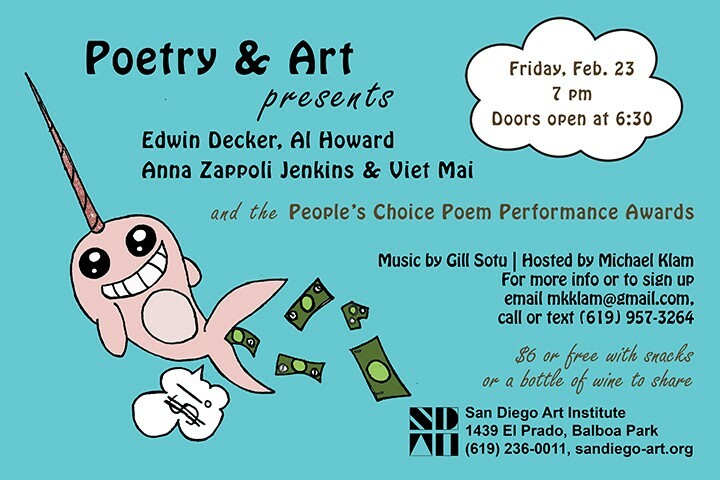 On Friday, February 23, Poetry & Art Series 2018 presents authors Edwin Decker, Al Howard, Anna Zappoli Jenkins, and Viet Mai. People’s Choice Poem Performance Awards follow featured readings and performances. 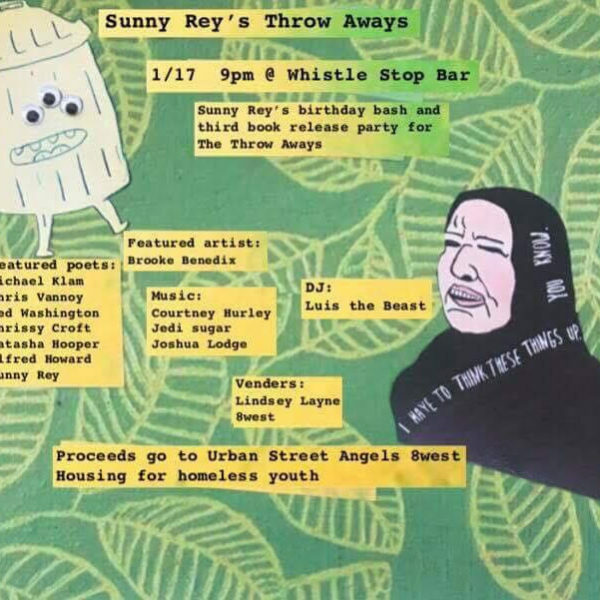 DJ Gill Sotu will provide music and sound throughout the show. This interactive arts and culture experience will include beverages, snacks and plenty of time to mingle. Doors open at 6:30 p.m., and the show starts at 7 p.m. Members are free, nonmembers $6 at the door. Bring a snack or beverage to share and get in free. The event takes place in the San Diego Art Institute, 1439 El Prado, Balboa Park. Edwin Decker is a freelance writer living in San Diego, California. He has contributed to magazines and newspapers around the country, including San Diego Reader, The San Diego Union-Tribune, The Stranger (in Seattle), Tucson Weekly, Cleveland Scene, Creative Loafing (Atlanta), Modern Drunkard Magazine and San Diego CityBeat – the latter of which runs his sarcastic, somewhat impolite column called Sordid Tales. His book of poetry, Barzilla and Other Psalms, was published by Puna Press in 2006. 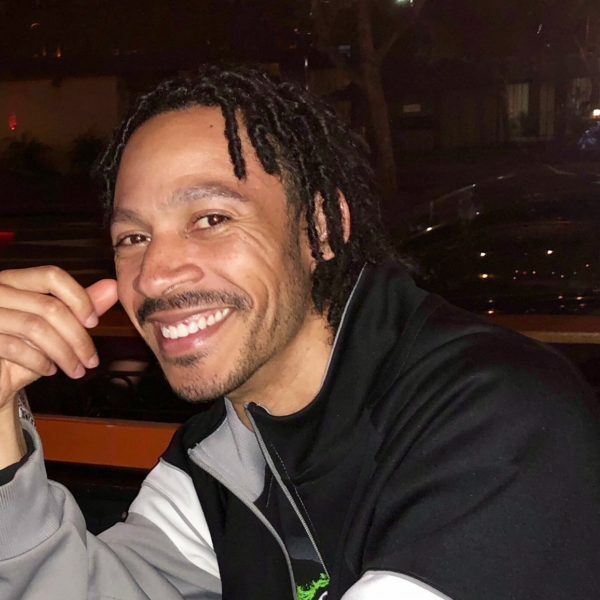 Al Howard is a musician, poet, and tireless advocate for music in San Diego. San Diego CityBeat declared Howard the hardest working man in show business and SD’s most prolific musician. Anna Zappoli Jenkins moved to the United States from Catania, Italy, in 1966. She studied art at Southwestern College and bronze casting at San Diego State University. Her works have been displayed in juried exhibitions, solo shows and award shows, and is collected in the United States and Italy. Her most recent book of poetry, Somewhere Else, was published by Puna Press, 2016. Viet Mai is an educator and performance poet. He was born in San Diego and graduated with a math degree from UCSD. Last year he earned a spot on the San Diego Slam Team, and the group won the 2017 National Poetry Slam. In 2015 he received a Special Commendation by the City of San Diego Race and Human Relations Commission. The People’s Choice Poem Performance Awards – Participants read/perform one poem under three minutes long. Audience members choose (by secret ballot) their favorite poem based on content and performance. Props, artwork, singing, music, dancing, all accompaniment is allowed and anything goes. Top poem performances (the poems that receive the most votes) win $50. Audience members will be encouraged to hoot for their favorites and try to influence the rest of the audience. Writers/artists who would like to participate in the People’s Choice Poem Performance Awards can get their names in the hat ahead of time at mkklam@gmail.com or text 619-957-3264. It is a good idea to sign up early by email or text message as space and time are limited! 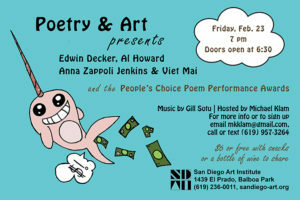 Support and sponsorship by San Diego Entertainment & Arts Guild, The San Diego Poetry Annual, and Puna Press. Leon Alexander Features at Palabra!